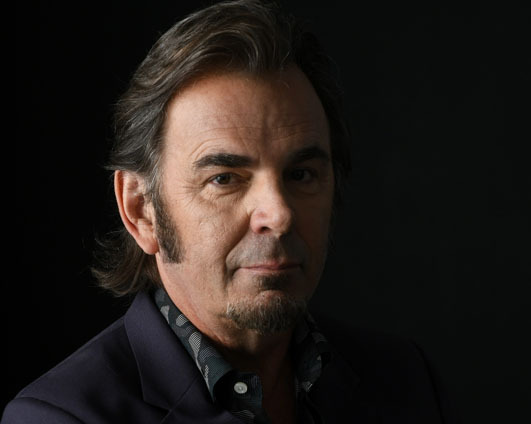 Jonathan Cain, longtime keyboardist and rhythm guitarist in Journey, is no stranger to writing songs about belief. He helped co-write “Don’t Stop Believin’”, one of the bestselling hits of all time. Now on his new Christian album, What God Wants to Hear, Jonathan shares personal songs about his faith journey. God has been guiding Jonathan’s path since his childhood days in Chicago. This started when, at a young age and part of the Gregorian boy choir, he wanted to be a priest. His faith was challenged after he survived a horrific fire in third grade at his school, Our Lady of the Angels School. 92 of his fellow students along with 3 nuns died that day. Jonathan would find healing and salvation in music. And it would be music that would eventually bring him back to God. It would be, aptly put, quite a long journey. At the age of eight Jonathan began accordion lessons, and by the time he was in his teens he was playing accordion and piano at parties and in clubs. His local church, Saint Maria Goretti, asked him to play pipe organ on Sunday services. After attending the Chicago Conservatory of Music at Roosevelt University, he relocated to Los Angeles’ Laurel Canyon in the 70’s. Jonathan signed with Bearsville Records as a solo artist, which led to an overlooked debut, Windy City Breakdown, in 1977. Cain then joined the UK power pop outfit the Babys in 1978, playing on Union Jacks and On The Edge. It was during the 1980 Journey tour where The Babys opened up for them that he was spotted by Journey’s manager, Herbie Herbert, as a natural replacement for the then departing Gregg Rolie. He joined Journey early in 1981. A run of hit albums and singles followed, many of which Cain co-penned, including ‘Who’s Crying Now’, ‘Don’t Stop Believin’’, ‘Faithfully’ and the quintessential power ballad, ‘Open Arms’. When he wasn’t working with Journey, he was producing albums as well and recording his own, such as 2001’s Anthology. With the eventual departure of Journey’s lead singer, Steve Perry, a long band hiatus, and the band discovering not one but two singers to follow in big shoes, Jonathan weathered professional and personal storms. “Sometimes God will give you exactly what you wanted to show you it’s not at all what you needed,” Jonathan says. After two failed marriages, his band breaking apart, and doors to the music industry starting to close, Jonathan found himself lost—literally and figuratively–on a stretch of road in Florida and eventually cried out to his Heavenly Father. But you knew, Lord, what was to come. Jonathan’s return to his faith coincided with discovering love and healing through Pastor Paula White, senior Pastor of New Destiny Christian Center in Orlando, Florida. They married in April, 2015. Jonathan found a new joy in his music after helping to lead a praise and worship time at his wife’s annual women’s conference. Paula asked him if would lead the worship, so Jonathan found some songs and learned them. Not only was he blessed but others were as well, including Paula. After constant encouragement to do a Christian album, Jonathan simply asked one question. “What does God want to hear from me?” And he asked God to show him. Soon week after week, the songs inside of Jonathan’s soul began to pour out. A sermon would provide inspiration for a song. Something a pastor might say would turn into one. Writing these songs reminded Jonathan of another writing session. The final sessions with Steve Perry in 1996 for the album, Trial By Fire. Back then Jonathan had only marveled and been jealous of his former bandmate’s newfound faith. He wasn’t there yet. Jonathan would have to go through his own personal trial by fire. “Only God can take a mess and turn it into a message, a test into a testimony, a trial into a triumph, a victim into victory,” Jonathan says. The first single of What God Wants to Hear is “Deeper than Deep.” Like the rest of the album, it was recorded at Addiction Sound, Jonathan’s state-of-the-art studio in Nashville. The video for the song features photographs Jonathan has taken throughout the years. A hobby for Cain, the photos now reveal how God’s been leading him to this place his whole life. The album has fulfilled Jonathan in a profound way. “I’ve never felt this close to the Lord in a long time,” he says. Jonathan hopes these songs will help others feel the same. Pastor Paula says “God uses brokenness to birth greatness.” This was seen when Jonathan almost gave up on his musical dreams and his father uttered the famous line “Don’t stop believing.” For Jonathan now, he feels he’s just starting to believe again.